Elections 2014: Voting and You! A guide for those interested in finding information related to the 2014 elections. The Foothill-De Anza (FHDA) Community College District has partnered with TurboVote to provide FHDA students with an easy, free and secure way to stay informed about deadlines and easy voting. 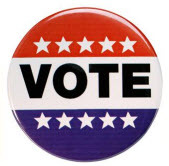 October 20, 2014 is the last day to register to vote in the November 4, 2014 General Election. Register now, if you haven't already done so, so you can vote! You can now register to vote in California. You will need your driver's license number and social security number. Learn more about the convenient benefits of absentee or vote-by-mail voting. From the League of Women Voters. Find out about voting in California, register to vote, locate your polling place, view a voter guide for your district. Understand your rights as a voter before you go to the polls. Answers to a variety questions about voting. Keep this document handy in case you have any difficulties voting on election day (PDF). Some frequently asked questions voter may have. Your one-stop guide to local voting resources including ballots and polling places. Use the search box to enter your zip code and find the candidates on your ballot for the upcoming election. Learn more about candidates' voting records and their stance on major issues. Covers officials from the local level to the executive branch. From Rock the Vote, what to expect on Election Day. From the Office of the Federal Register, FAQs about the U.S. Electoral College. "The Commission on Presidential Debates (CPD) was established in 1987 to ensure that debates, as a permanent part of every general election, provide the best possible information to viewers and listeners."